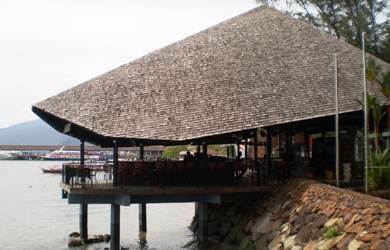 This is a cozy restaurant & bar associated with Royal Langkawi Yacht Club in Kuah. From the main clubhouse there is a fairly long stairway that leads to this wonderful place with a hardened straw roof and open on all sides. Why would you come to this corner of the town leaving aside so many other bars & restaurants on the way? Because the view of the kuah Bass Harbor with backdrop of the mountains and the lovely marina with so many sailing boats being moored is probably unmatched anywhere else. Although Charlie's serves breakfast, lunch and dinner, it is probably most popular because of its unparalleled sunset view over the harbor. Imagine having a cocktail in a quiet tranquil ambience with view of the setting son over the harbor... it's a privilege! After dark, you will find many locals and yachties pouring in, either taking their seats around the bar to have chats with the bar tender and between themselves or sit at a quiet corner with a table facing the water. This is a very popular place with the yachters who moor their boats at the club's marina. However it mostly remains quiet and not so crowded. In appetizers, although we have tried several different salads on different occasions, prawn cocktail stands out from the rest. Prawn is poached and served with crispy lettuce, tomato and other salads. The only complain if any would be the size of the portion. The main courses are mainly international and Malay cuisine. If you like grilled fish, then go for Ikan Bakar Platters where seabass fillet is served barbecued on banana leaf and accompanied by vegetables and fruits. It is prepared in Malay style. In international dishes few of our favorites includes barbecued beef spare ribs, braised lamb shank and of course fish & chips. Another nice dish is the Yacht Club Platter which is a special dish of the restaurant. A combination of chicken sate, beef, sweet & sour fish, crispy vegetables, fruits and a portion of rice is served. Among Malayan preparations some that are stand out from the rest are beef randang and the traditional chicken curry combined with yatch club fried rice. For desserts, you can finish it off with fruit cuts, ice creams, brulee or cakes. 3) Food is okay. No other great attractions. A standard main course dish would cost about RM30-50. Daily from 9am to 10:30pm. Happy hours is from 4pm to 7pm. You can walk in. No reservation is required, although they do take reservations and table bookings as well. Great ambience for couples and families.